The new exhibit RockPaperScissors|Playing with Material Change, featuring more than 20 artists, has an opening reception on Friday night during Artwalk Gainesville. From a distance, Cindy Steiler’s breathtaking, mixed media work titled “Vestige” appears to be part quilt and part wind chime, all in sepia tones. But step closer to the 6-by-12-foot creation and you soon realize there are hundreds of eyes staring back at you in the form of portraits from vintage photographs. Each and every photo is framed or detailed with stitched, woven, crocheted or embroidered fabric. Detail from “Vestige,” by Cindy Steiler. The faces of the long forgotten suddenly leave a new impression. “This piece seeks to present the forgotten in a fresh context, reinfusing and charging these images with new meanings and a new dignity,” Steiler said in her artist statement. 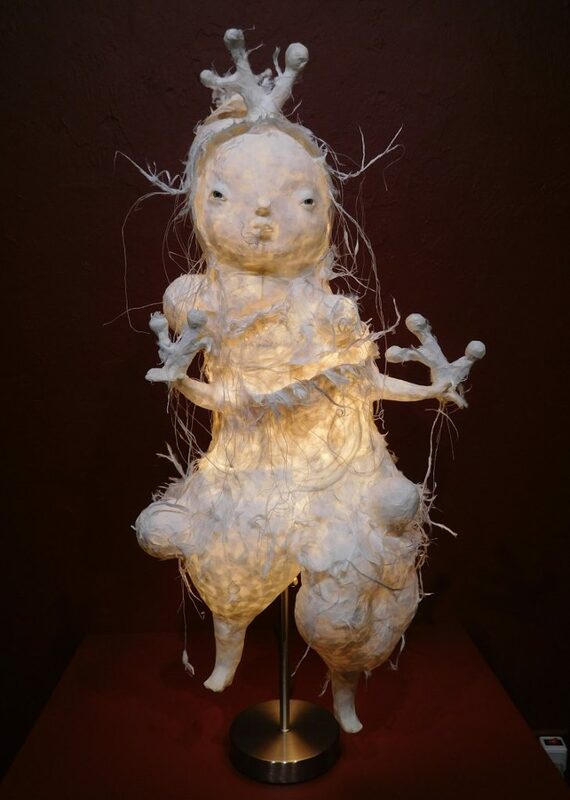 “Vestige” is just one of dozens of pieces from 23 local and regional artists on display in RockPaperScissors | Playing with Material Change, a new exhibit opening this week in the Galleries at the Historic Thomas Center, 302 NE 6th Ave. The exhibit will have an opening reception on Friday from 7-9 p.m. during the monthly Artwalk Gainesville. There will be complimentary refreshments as well as blues and soul music in the Spanish Court by The Ramblin’ Mutts. The RockPaperScissors exhibit, which continues through Jan. 4 in both the first-floor Thomas Gallery and the upstairs Doris Bardon Gallery, is a celebration of artists whose works lend themselves to tactile satisfaction. Materiality itself acts as muse in RockPaperScissors, giving viewers a glimpse into how artists both command and yield to their materials during the creative process. 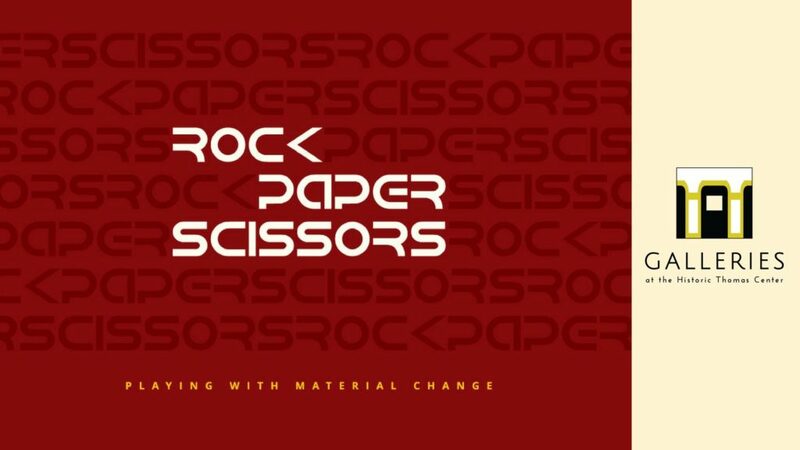 Among the materials used by artists in RockPaperScissors are satin, silk, fibers, soapstone, limestone, alabaster, cotton, threads and mulberry paper, to name a few. 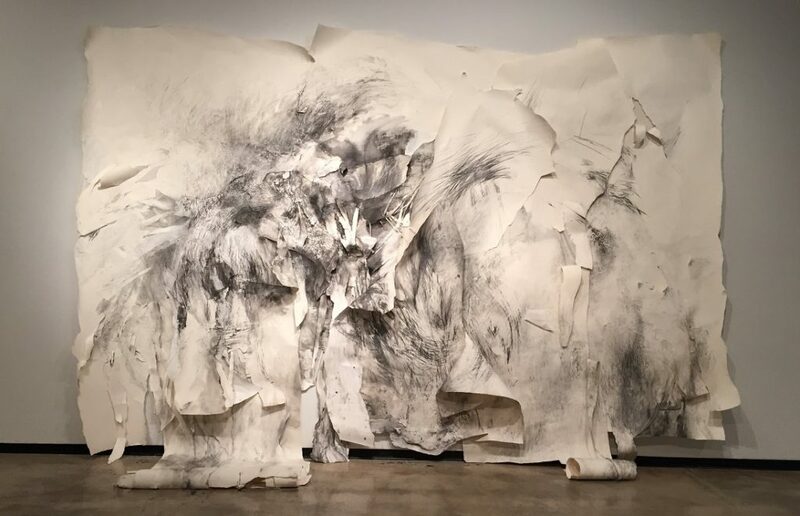 Among the other impressive pieces on display are a 15-foot-wide graphite-on-paper drawing by Santa Fe College professor Jiayuan (Emma) Shen and two paper sculpture lamps by Gainesville’s Kana Handel. During the three-month exhibit, some artists will provide lectures on their work. For example, Ellen Knudson will talk about the process of making handmade art books while Erin Curry is scheduled to give a talk about hand-spinning silk on a wheel. Other artists featured in RockPaperScissors include Desserae Bassil, George Ferreira, Amy Freeman, Louise Freshman-Brown, Cindy Grisdela, Lisa Iglesias, Lennie Kesl, Maggie Kotuk, Julia Morrisroe, Kymia Nawabi, Jaime Puig, Genaro Ramos, William Schaaf, Bradley Smith, Amy Vigilante, John Westmark, Hiram Williams and David Zayas. 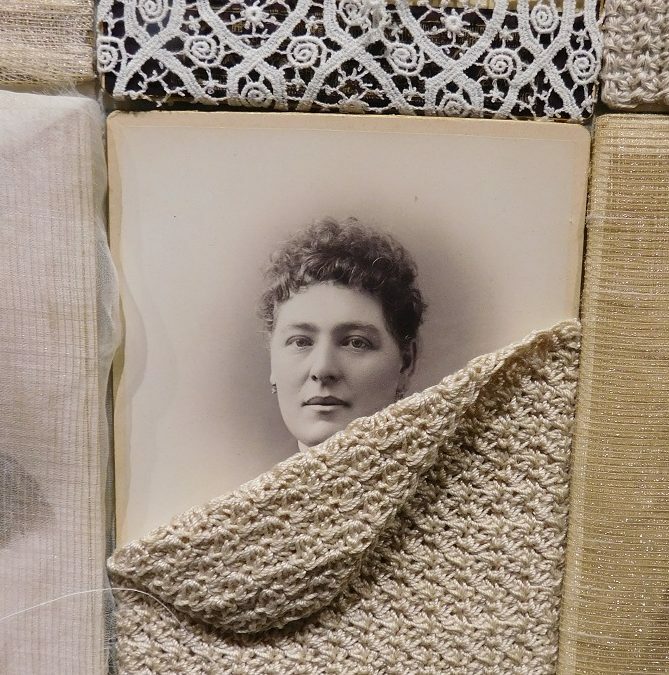 In Steiler’s piece, “Vestige,” the artist used more than 200 original photos taken during the late 1800s. Steiler said none of the photos have a provenance. She has no information about the people in them except that they are no longer alive. Thus, the title “Vestige,” or a trace of something that no longer exists. She also gets joy from using vintage fabric and other old materials to assemble her pieces. For example, she has used pieces of lace from an old traveling salesman’s kit from an era when it was common for women to sew at home. In fact, Steiler said she credits her great grandmother for teaching her all the “womanly” arts when she was a girl. She later used those skills in her career in theater as a set designer and costume designer. Now she uses them in her artwork. She refers to textile arts as a connection to the past. Following Artwalk, the RockPaperScissors exhibit will be available for viewing at the Thomas Center weekdays 8 a.m.-5 p.m. and Saturdays 1-4 p.m. Admission is free. First Magnitude Brewing Company (1220 SE Veitch St.): Hosting a variety of artists and music by Dylan Gerard, as well as food trucks, craft beers and more. Note: Artwalk hours 6-9 p.m.
Civic Media Center (433 S. Main St.): Showcasing art by Oliver with “The Grass is Always Greener” and Michael Wood’s “Seraphim & Undone” accompanied by Silent Disco, which begins at 10 p.m. Entry for Silent Disco will be through the patio entrance. $5-$10 donations accepted. 4Most Gallery (534 SW 4th Ave.): Presenting “Hot Pot” by Almaz Wilson and Minah Shim. This exhibition symbolizes their first time working together on drawings and sculptures. Like an actual hot pot, their process involves complex layers of messy, spicy ingredients leading to rich discussions, routine flows of creativity and moments of reflection. 4Most Gallery is supported by UF’s School of Art and Art History to connect SAAH students, alumni and faculty with the greater Gainesville community through innovative and dynamic exhibitions and programs. Santa Fe College Center For Innovation and Economic Development (CIED), 530 W. University Ave.: Presenting the debut exhibit, “Songbirds,” by Enrique “Eric” Estores under the tutelage of muralist, printmaker and painter Turbado Marabou. Eric’s work will hang in the lobby throughout October. Prints and notecards will be on sale during Artwalk. Event co-sponsored by Bailey Learning and Arts Collective (BLAAC), Inc., and the Alachua Audubon Society. Maude’s Classic Café (101 SE 2nd Place): Welcoming Warren Goodwin, a Gainesville artist for more than two decades. Explore his UFOs, aliens, eyeballs as well as Goodwin’s stylized cartoon painting of a variety of oddities. The Bull (18 SW 1st St.): Hosting Molly Kempson, a printmaker using linocut and letterpress prints under the imprint Spotty Boy Press. Her work is about the flora, fauna, architecture and language of the South. She uses it to highlight historic preservation and environmental conservation efforts. Hardback Cafe (211 W. University Ave.): Featuring mixed media abstract artwork by Scott Littler and music by H.R. Gertner. Also, enjoy imported cheeses and hors d’oeurves at the bar. The SL8 (10 E. University Ave.): A new art space from Gerard Benson featuring the works of Grace Lamerson, Danielle Heslep, Howard Wapner, Virginia Zuelsdorf, Michael Levy, Amye Francis, Lucas Thon, Charley McWhorter, Natacha Monalisa, Jade DiMarco, Pateh, Jiri Lonsky, Lennie Kesl, John Korb, Cory Collins and Josiah Lloyd. 352Walls Parking Garage (105 SW 3rd St.): Although not an official Artwalk venue this month, Gainesville’s Urban Revitalization Project invites you to explore the extensive street art inside the Southwest Garage Gallery. Hill Top Gallery (821 NW 13th. St. Suite B): The gallery is sponsoring an art contest for the American Cancer Society. Explore the new 2,500-square-foot gallery filled with art, antiques, gifts and collectibles. Free wine, cheese and crackers. Open Monday-Friday 11 a.m.-6 p.m. and Saturday 11 a.m.-7 p.m.